The most common VHS tape available. Contains the Follow the Leader and Monster Factor episodes. 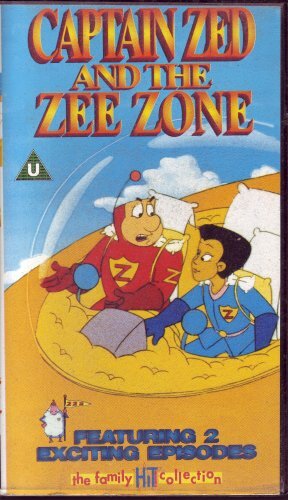 Captain Zed and the Zee Zone is a British-American animated series created by Tony Collingwood and produced by DiC Entertainment. It originally aired in 1991 and was 26 episodes-long (made of two 13-episode seasons). 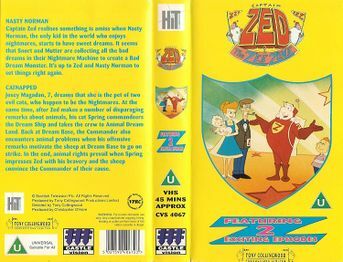 Captain Zed is an agent of the Dream Patrol, part of the Dream Base, an organization that monitors children's dreams when they are asleep at night and makes sure that nightmares do not appear. Piloting a Dreamship, he is assisted with his co-pilot P.J. and pet cat Spring. He also tends to be annoyed by a pretentious and ambitious rival, Captain Flannel. The Dream Base is run by anthropomorphic sheep, led by the Commander. Most of its architecture, elements, and machine designs are sleep/bed-themed. 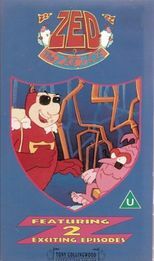 The main villains are Snort and Mutter, two shapeshifting monsters who want to take over the Dream Base and send nightmares to children's minds. 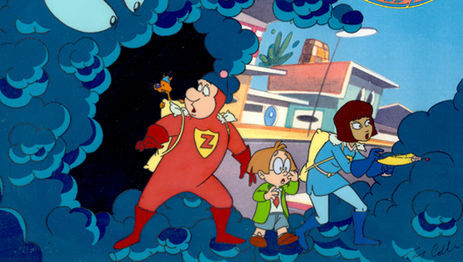 The series has been aired in many countries over the years (especially Europe). 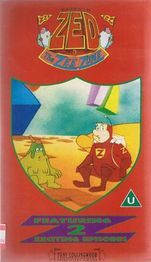 However, it has never been released on DVD and only a few episodes have been sold on VHS tapes, some of them quite rare. They can be found for sale on eBay and Amazon. A few episodes dubbed in German and Polish have also been uploaded online. All episodes from the aforementioned tapes have been uploaded to YouTube by Gilby 1385. The rest of the series was uploaded to YouTube in October-November 2018 by user sabina pokorna, albeit with the audio almost inaudible. Contains the Nasty Norman and Catnapped episodes. Contains the Making the Grade and Curtain Call episodes. Contains the "Revenge of the Killer Bunnies" and "Finishing School" episodes. 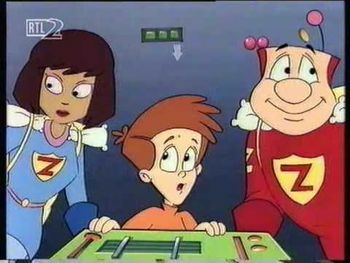 Screencap from an episode, with PJ on the left and Captain Zed on the right. Note PJ's redesign that seems to be exclusive to a season. An animation cel, signed by creator Tony Collingwood.